Over the past five years UBC Library has aligned our priorities with current and future trends. Check out our Community Report: Year 5 for an update on our transformation in discovery, learning, collaboration and research. Disaster Print, 1854, from the Japanese Maps of the Tokugawa Era Collection. 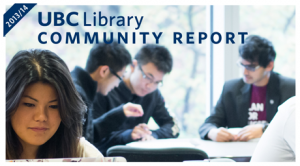 The latest issue of LibFOCUS celebrates the Library’s connections to the community, including the launch of the annual Community Report and a listing of Asian Heritage Month activities. Highlights include Preservation Week’s personal histories, a new exhibition of illustrated historical menus, a screening of the documentary Passage of Dreams: the Chung Collection and more. Sustainability is also a key commitment in Place and Promise, UBC’s strategic plan – and we wanted to show some of the ways that the Library is supporting economic, environmental and social sustainability at the University. Our efforts include contributions to Better World Books, physical and digital preservation programs, digitization projects on the Vancouver and Okanagan campuses, a technology training program for international students, and initiatives that support open and unfettered access to knowledge. In the spirit of sustainability and engagement, the Community Report is being published solely online – we encourage you to post comments and share our stories. Enjoy – and let the conversation begin! The Library’s Tech Training program helps international students get IT-savvy. This story appears in UBC Library’s 2013/14 Community Report. Read more to find out how we’re supporting economic, environmental and social sustainability at UBC. You’ve spent most of your life in a refugee camp halfway around the world. You’ve also just been accepted to start at UBC next September. The international student experience often begins with digital instructions on an array of topics: tuition, registration, email accounts, course accessibility and more. Students are also typically assumed to have basic tech competencies for the 21st-century classroom – but that isn’t always the case. “With students from 151 countries, it’s important to be mindful of context in that students coming from different places may be coming from varying degrees of experience and access to technologies,” says Michelle Suderman, Associate Director, UBC International Student Development. 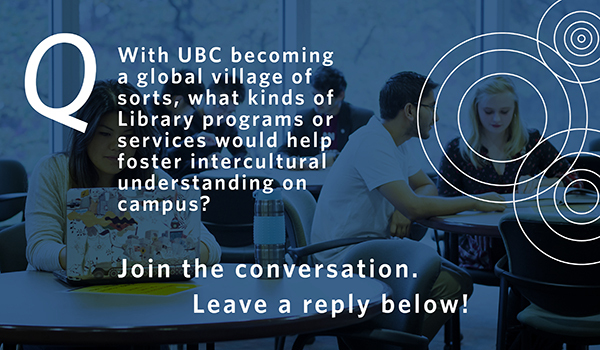 Enter UBC Library as an intercultural bridge. For the last two years, the Library’s Chapman Learning Commons (CLC) has provided a customized Tech Training program to UBC students from the World University Service of Canada Student Refugee Program (WUSC-SRP). The program is delivered by a CLC student assistant and Julie Mitchell, the CLC Managing Librarian. International students are offered an overview of technology basics – including email platforms, understanding the differences Macs and PCs, course management programs (such as Connect), scanning and printing, and software programs available at UBC Library. The program accelerates technology fluency and inspires confidence, thanks to new-found skills that can be applied immediately in course assignments and research. “Growing up in a refugee camp in Kenya limited my ability to access technology,” acknowledges Rhoda Philip, an undergraduate science student who took the program last year upon arriving in Vancouver. “Everything is about technology here.” After a couple of weeks of training, Philip felt more at ease, thanks to the program and the peer-to-peer learning experience that it fosters. Cameron Frayne, a CLC student assistant who co-developed the Tech Training program, said several students are requesting more advanced program services – which could include instructions for tech tools and programs such as Adobe Illustrator, HTML and data visualization. The program also fosters a spirit of community – some students participate in Tech Training development, while others promote the program to the next crop of WUSC-SRP students. The program will begin its third year in fall 2014. Anne Lama, UBC Library’s Conservator (left) and Chelsea Shriver, Student Librarian, prepare for a book exhibition at Rare Books and Special Collections. Since arriving at UBC in 2013 after a decade-long stint at the National Archives in France, Lama has been developing a comprehensive preservation and conservation strategy to safeguard the Library’s vast physical collections. That’s no small task, given the challenges of working with finite materials. Paper and cardboard, after all, degrade. Leather covers dry out. Aging newsprint turns yellow and eventually disintegrates. In response, Lama has been busy training staff across the Library system in preservation and mending techniques. She’s also worked with Rare Books and Special Collections and University Archives to ensure a high level of collections care, and planned a range of public and staff-related activities to celebrate Preservation Week, an annual spring event. A top priority moving forward is the establishment of a conservation lab in Woodward Library. “Anne’s contributions are already making a huge difference in terms of staff training, programs and the development of facilities for conservation,” says Alvan Bregman, Head of Technical Services. The need to preserve collections for generations of scholars, researchers, students and lifelong learners also extends to the digital realm (indeed, managing collections in a digital context is one of the Library’s key directions in its strategic plan). Dizzying changes in formats and software can make it difficult to keep electronic assets – ranging from e-books to archival items – from disappearing into the digital ether. In response, UBC Library began formulating its digital preservation strategy in 2011. Since then, it has worked with Artefactual Systems, a Metro Vancouver company, on an open source digital preservation system to help ensure that University publications, databases, theses, data sets and other types of digital collections endure. The Library is also involved in other initiatives, including a collaborative project with Simon Fraser University and the University of Alberta that could lead to a Western Canadian preservation “backbone” and, ultimately, a national digital preservation network. Join the conversation: The Library also depends on its users to help care for its collections. What steps can you take to ensure that Library materials are maintained for generations to come?